Swansea backpackers offers excellent budget accommodation for backpackers,families,groups and is a comfortable and safe base to explore, rest or work from whilst exploring australia's island state. Bed in a 6 bed bunk style dormitory includes clothes hanging rack/luggage space, incl all linen and towels. 1 double bed @ $85.00. Plus 2 bunk style beds, luggage space, clothes hanging racks, incl linen and towels. Shared bathroom and Kitchen Facilities with-in Hostel. Bunks @ $20.00 per child/$39.00 per adult. Room will sleep 4 people. 1 double bed @ $85.00. Plus 1 single bed., Luggage space, clothes hanging rack, incl linen and towels, Shared bathroom and Kitchen facilities with-in Hostel. Single bed @ $20.00 per child/$39.00 per Adult. Room will sleep 3 people. 1 Queen bed @ $90.00. Plus 2 bunk style beds, luggage space, clothes hanging rack, incl all linen and towels. Shared bathroom and Kitchen facilities with-in Hostel. Bunks @ $20.00 per child/$39.00 per adult. Room will sleep 4 people. $90.00 per night. Rates include all linen, doonas, pillows and towels to all beds. Pay for 3 nights and stay for 4 nights. Stay 2 nights and the second night is 20% discount. Un-powered sites @ $25.00 per night per 2 people. 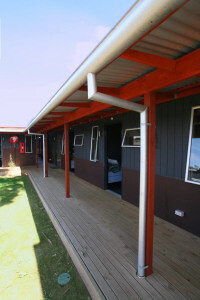 Limited Powered sites @ $30.00 pn/per 2 people. Power use via meters. A Late Check-in fee after 10pm. Cancellations less than 7 days of date of arrival - no refund. DOUBLE, TWIN, FAMILY ROOMS CANCELLATION POLICY!